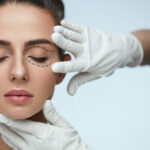 /What Are the Benefits of Upper Eyelid Surgery? Upon seeing your reflection, do you frequently feel your eyes—your upper eyelids, to be specific—make you look more sleep deprived or even older than you actually are? For the majority of women and men, the eyes are usually the first facial features to display symptoms of aging, often manifesting in the form of lax skin, excess tissue, and fat displacement in the upper eyelids. Depending on their severity, these cosmetic issues can create a perpetual appearance of exhaustion. In some instances, they can even obstruct a person’s upper field of vision. In the event a more comprehensive enhancement is needed and/or desired, an added benefit of upper blepharoplasty is that it can often be easily combined with lower eyelid surgery, brow lift surgery, and/or facelift surgery. For more information about upper blepharoplasty, or if you are interested in scheduling a consultation to find out if this treatment is right for you, please don’t hesitate to contact 740 Park Plastic Surgery today at 800-941-8459.